As some of you may be aware, I’ve been working on and off on a new library to define what graphs are in Haskell. This is the first part of a series on some of the thought processes involved in trying to define classes that fit the vast majority of graphs. The structure of the graph. The information explaining what the structure means. As an example, consider graph colouring: we have the actual structure of the graph and then the colours attached to individual vertices (or edges, depending how you’re doing the colouring). Another example is a flow graph, where the distances/weights are not an actual “physical” part of the graph structure yet nevertheless form an important part of the overall graph. Yet there are times when the extra labelling/information is an inherent part of the structure: either we are concerning ourselves solely with some graph structural problem (e.g. connected components) or – more commonly when programming – the information about the structure is embedded within the structure (for example, Cabal’s PackageIndex type: this is simplistically equivalent to an unlabelled graph with PackageIndexID as the node type). A graph can choose whether or not it has node or edge labels (if I understand correctly, this is the approach taken by the Boost Graph Library for C++). A graph either has no labels or it has both node and edge labels. All graphs must have both node and edge labels (even if they’re just implicit labels of type ()). Something along the lines of the first two options is very tempting: there is no requirement to force graphs that don’t have or need labels to pretend to have them just to fit the constraints of some class. 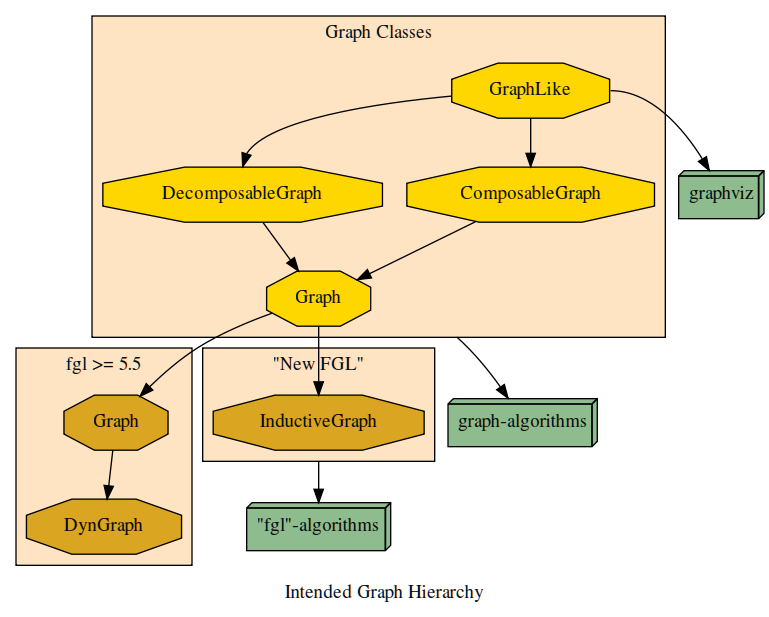 Furthermore, different graph types can thus be more specific in terms of which graph classes they are instances of. So if some graph type wants to be an instance of LabelledGraph, it must specify two ways of getting all of the nodes available (admittedly, it will probably have something along the lines of nodes = map fst labNodes, but wouldn’t it be nice if this could be done automatically?). But OK, writing a set of classes and then instances for those classes is a one-off cost. Let’s say we accept that cost: the problems don’t stop there. First of all, consider something as simple as adding a node to the graph. There is no way (in general) that the two classifications (labelled and unlabelled) can share in the slightest a method to add a node, etc. Furthermore, this segregation would spread to other aspects of using a graph: almost all algorithms/functions on graphs would thus need to be duplicated (if possible). Since one of the main criteria I have for designing this library is that it should be possible to use graphviz to visualise the PackageIndex type, this kind of split is not something I think would be beneficial. As such, the only real viable choice is to enforce usage of labels for all graphs. This might be to the detriment of graphs without labels, but I’m planning on adding various functions that let you ignore labels (e.g. a variant of addNode that uses mempty for the graph label, which means it’s usable by graphs that have () as the label type). The distinction between nodes and labNodes above could also be made automatic, with only the latter being a class method and the former being a top-level function. This solution isn’t perfect: to ensure it works for all suitable graph types, it has to be kind *. But this means that no Functor-like mapping ability will be available, at least without really ugly type signatures (which the current experimental definition uses) at least until superclass constraints become available (or possibly some kind of kind polymorphism, no pun intended). However, this is still the best available solution that I can come up with at this stage. Eleven days ago I set up a survey to help determine what the community thought the new version of FGL that Thomas Bereknyei and I are working on should be called. This post is about the results from this survey. Optionally, their name and email address. Why is there only the option of “fgl” and “inductive-graphs”? Because we couldn’t think of any better names. The former is what the library is already called, the latter describes exactly what the library is about (implementing and using graphs in an inductive fashion). Any other names such as “boxes-and-arrows” are, we feel, rather silly and don’t make sense. We did ask, but didn’t hear any other names that were relevant. Why should you even consider using the name “fgl” if this is a new library? I don’t want to go through the whole thing all over again, but I’ll summarise. This isn’t a completely new library; it’s just a new implementation (e.g. same as going from QuickCheck-1 to QuickCheck-2; the point of the library is the same, the concepts are the same, the implementation is different and the APIs are incompatible). As for the API incompatibility, that’s what version numbers are for. FGL is a silly name anyway/Acronyms are bad in a package name/The word “graph” should appear in the package name/etc. Agreed. However, the package name “fgl” already exists, and I don’t believe in gratuitous proliferation of package names on Hackage as its hard enough to navigate as it is. Most people in the Haskell community already know that “fgl” is a graph library, etc. Also see the response to the previous question. You’re the maintainers; why are you bothering to even ask what the name should be? Because when we announced our plans, there was a number of vocal people that complained about our “usurpation” (my word, not theirs) of the FGL name for our own library. Why are you planning on using the same module namespace as FGL even if you change the package name? Won’t that cause problems ala mtl and monads-fd? Say what you like about the name of the package (I for one agree that it isn’t an ideal name, especially in the world of “modern” Haskell with Hackage, etc. ), I think the module namespace is exactly right. And unless we decide to skip the “Data” prefix and just have a stand-alone Graph. * namespace, there isn’t a better namespace available for a package that defines and uses graphs in an inductive fashion. Again, this is a case of “You don’t like it? Fine: pick a better name and if it truly is better we’ll use it.”. If you have to change the API, please provide a compatibility API like Parsec-3 has for Parsec-2. Even with the compatibility API, Parsec-3 was slow to be taken up. Admittedly, this was due to a performance regression, but it still doesn’t bode well for how well compatibility APIs fare. Parsec-3 could have a compatibility API because they defined a new module namespace for the new API; we don’t plan or want to do that. If we have a compatibility API now, we’ll be forced to keep using and maintaining it when we’d much prefer people to use the nice new shinier API instead. We plan on providing upgrade paths, such as versions of fgl in the 5.x series that get closer and closer to the new API and various migration guides/tutorials. Most of the function and class names are going to be pretty similar specifically to make porting easier (because of this I’m even planning on using FGL-like terminology for my currently-still-vapourware generic graph library that will eventually provide super-classes for FGL, rather than the more correct graph-theory terminology; e.g. Vertex rather than Node). We might have some compatibility APIs to help with the transition process (e.g. the noNodes function is going to be replaced with order, which is the proper terminology, but we might define noNodes as an alias), but these will probably be in a different module and it will still not be possible to have code that will work with both the 5.x series of FGL and the new library. 66 people responded (Google Spreadsheets keeps lying to me and claiming 67, but it seems to be counting the header row as an actual response…). 27 (≈ 40.9%) people said they preferred “FGL”; the other 39 (≈59.1%) prefer “inductive-graphs”. 40 (≈ 60.6%) of the respondees said they wrote code dealing with graphs. There were 26 (≈ 39.4%) extra comments. Only 23 (≈ 34.8%) of respondees were brave enough to add their name to the response (and one of these was only a single name without an email address). If we only consider the 40 people who claimed to write code dealing with graphs, only 16 (≈ 40%) of them preferred FGL; as such, actual usage of fgl or other graph libraries does not seem to change the overall opinion of the community (if my vague recollection of how to do statistics is correct, and this is indeed a representative sample of the community). Martin Erwig (i.e. he-who-wrote-the-original-version-of-FGL) says we should keep using the name “FGL”, laying to rest potential problems that some people have raised. Two people didn’t seem to get the point of the survey: one person indicated that they didn’t care, another made an unrelated comment regarding immature equines. However, they partially cancelled each other out: the former claimed to write graph code and voted for fgl, the latter said they didn’t write any graph code and voted for inductive-graphs. For those that want it, a sanitised (in that the email addresses and names have been removed) copy of the results is available (I would have hosted them on wordpress.com with the blog, but it doesn’t allow text files to be uploaded, and I don’t see the point of creating a full blown word processor document – since spreadsheets can’t be uploaded – just for some CSV data). And so the decision is? Well…. there isn’t one. A 60% preference is too close to even for me to categorically say that the Haskell community prefers one name over another. As such, unless someone presents a really good reason otherwise we’re going to stick with FGL (due to inertia if nothing else). After all this debate, I’d like to point out that I’m more and more agreeing that “inductive-graphs” would make a much better library name. However, as I’ve stated previously (including above), I would prefer to use the “fgl” name somehow if nothing else because it’s already there (so a few years from now when – hopefully – the new graph libraries are available and widely used, we don’t have a useless library sitting around confusing people, especially when it used to be present in GHC’s extralibs and the Haskell Platform). What about if we call the library we’re working on “inductive-graphs”, but then create a meta-library called “FGL” that isn’t just limited to inductive graphs? That is, once I’ve worked out my generic graph API library, then we take a large subset of the modules defined in the libraries contained within this figure and re-export them from the FGL library. Such a library would be analogous to how the Haskell Platform is an initial starting point of the libraries available on Hackage: an all-in-one subset of the available graph libraries in one overall API if you don’t know which libraries to use specifically, and you can then pare down your dependencies to what you actually use. Another alternative (which I find less attractive) is that we make the FGL library contain the generic graph API; this way the library still exists, but then it is completely different from the 5.x series. I’m mainly suggesting this just to provide another alternative; I don’t think it really makes sense or is viable. Making Functor more relevant; taken to the extreme by the “Caleskell” definitions used by lambdabot on IRC, where it seems almost everything can be expressed in terms of fmap. Now, I think this kind of discussion is an indication of good health in the Haskell community where we are doing our best to determine what the optimal solution to these problems are (rather than just giving up or being dictated to by a single individual). However, something I’ve come to realise recently is that in my understanding these discussions are mainly oriented at what the best way to abstract how we write code rather than how we use the data structures that make up the code. Hence, the topic of this blog post. What I want to discuss here is the concept of how we can best define class hierarchies that let us easily interchange our data structures. The purpose of this is that currently, if I write some code using a list as my underlying data structure and then decide that a Sequence would be a better fit because I do a lot of appends, I have to re-write every single bit of my code that knows about that particular data structure. However, I would much prefer to just have to change a few top-level type signatures and maybe some list-specific items in my code and then the magic of type classes would take care of the rest. The main focus of when such a hierarchy would be useful is when writing libraries: duplication is avoided by having to write a list-specific, a Sequence-specific and a Set-specific version of a function (e.g. to test if the data structure in question has at least two of the provided values). 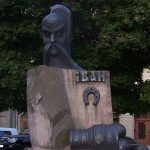 More than that: often times we are constrained in terms of how we use libraries by what data-type the library author preferred at the time of writing. A library function may require and then return a list, whereas we’re using Sets everywhere else. If there is no pressing reason to use a list rather than a Set, then why should it? Is such a hierarchy already available? Functor + Foldable + Traversable; this approach can’t deal with structures such as Sets as they require an extra restriction on the parametric type. Edison can cope with Set, etc. and has a nice hierarchy between the individual sub-classes (if anything it has too many sub-classes), but is used by very few packages and has what I consider to be a few warts, such as explicitly re-exporting the data types in question in new modules, and some methods (such as strict) that really belong elsewhere. collections seemed to have been another attempt at this, but never seemed to have built on any version of GHC since 6.8. When you only want to consider structures with a linear structure, ListLike is available. However, it seems to be possibly over-busy. Even more specialised than ListLike is IsString, the point of which is to be able to use string literals in Haskell code to define Bytestrings, etc. The closest viable class/library to my ideal listed above would be a cross between Edison and ListLike; the former has an actual class hierarchy (to avoid duplication, etc. ;) whereas the latter seems to be used more in actual practice. My point here about a class hierarchy is this: in most aspects, any sequence (or “ListLike” data structure) can be considered a really inefficient generic collection/set: you still want to have a function to test for membership, you want to be able to add values, to know how many there are, etc. As such, definitions should be as high up in the hierarchy as possible to let functions that use them be as generic as possible in terms of their type signatures. There is one conflicting issue in any such hierarchy: mapping. Ideally, we wouldn’t want to require that instances of these types have kind * -> * (so that we can for instance [pun not intended] make Bytestring an instance of these classes with a “value type” of Word8). However, as soon as we do that we can no longer specify a map function nicely. ListLike gets around this by defining a map function that doesn’t constrain the data structure type. This means that it’s possible to write map succ with a type of ByteString -> [Word8]. Whilst this might be handy at times, it also provides possible type-matching problems if your overall definition when using them doesn’t force them to be the same (e.g. : print $ map (*2) [1,2,3,4]), and that in essence this definition of map does a complete fold over the data structure, whereas there may be more efficient versions if we can somehow specify at the type level that it must be constrained to the same data structure. In essence, the whole point of the MappableCollection class is to force the Collection instance back into having to kind * -> *. It might be better just having Collection use ListLike’s rigidMap and then leave “normal” mapping up to Functor or RFunctor (which works better with the whole “class hierarchy” concept). It’s just a shame that there’s no way of having mapping work regardless of the kind of the data type. I’m going to make a stab at yet-another-collection-class-hierarchy this weekend at AusHac. I’m not sure how far we’ll get, but I’ll see. That is, the actual “graph” library will also cater for other graph-like data structures, such as Cabal’s PackageIndex type. FGL (both the old and the “new” version, whatever it’ll be called) will then extend these classes to provide the notion of inductive graphs; anything that isn’t directly related to the notion of inductive graphs will be shifted down to this notion of “generic graphs”. In terms of terminology, to ease the transition I’m probably going to stick to current FGL-nomenclature for the most part (unless there’s something horribly wrong/bad about it). So we’re still going to talk about Nodes rather than Vertices, etc. As I intimated in the extended announcement for fgl-5.4.2.3, apart from bug-fixes we’re not going to work on the current 5.4 branch. The 5.5 branch will be developed so as to use the generic graph classes once I’ve got them sorted out, and then that will probably be the end of it. Now, this has become a rather hot topic: should a rewrite of FGL still be called FGL? I’ve covered this earlier, but I have now created a survey to try and find out what the community thinks it should be called (I did want an “other” option in the first drop-down menu, but Google Docs wouldn’t let me 😦 ).